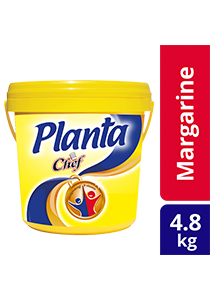 Planta delivers that iconic margarine taste known and loved by Malaysian diners since 1930! No one can resist a dish that is fragrant, attractive and delicious. Planta delivers that golden colour and fragrant aroma loved by Malaysians since the 1930s. Delivers that golden colour and fragrant aroma loved by Malaysians since the 1930s. Palm Oil, Palm Kernel Oil, Salt, Soya Lecithin, Vitamins. Contains Permitted Antioxidants, Colouring and Flavouring. All food additives used is from plant, synthetics and animal origin. May contain traces of milk. Ideal for baking, cooking and spreading.